This week we are celebrating Ilya's 50-puzzle points achievement with an exclusive interview. Everything you ever wanted to know about Ilya but couldn't guess from him puzzle answers. Q: You are wise, handsome, well-fit Secret Service agent. How many of these descriptors are true? I do like to help people, so "service" part strikes as true. I hope I am well-fit, but ask me again in 20 years. Q: Hmm, evasive answer. Speaking of spies, do you see yourself more like Mr Bean or James Bond? More like Bill Murray (my favorite actor) in "The Man Who Knew Too Little". Q: Does your "official" job have anything to do with math? Yes, I am a software developer, which requires knowledge of logic, graph theory, set theory, combinatorics just to name a few areas. On top of that, I've been specializing in Computer Aided Design (CAD) for most of my career, and that involves lots of three-dimensional geometry and linear algebra. 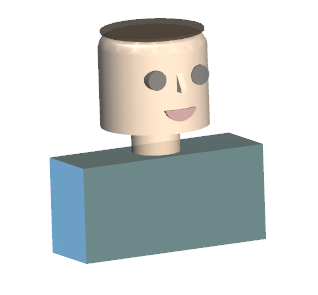 You asked for a picture - so I created a simple avatar (of myself) in the web-based Computer Aided Design product that I am developing right now. Snapshot attached. Of course I gave myself more hair than I do in real life :-). Q: The snapshot that you attached, is this the picture you use on your drivers license? Q: What is the most complex object you ever had to design in CAD using those primitive geons? My wife had some great ideas for a kitchen re-model and we wanted to see how it would look before starting the project. So I had to model the existing conditions and then the new kitchen within. It was much harder than I expected. Making software for others is one thing, using it yourself to achieve specific goals is quite another :-). Q: What was the most absurd object? Q: What is the most interesting project you ever applied math to, in your daily life or work? It's hard to put a finger on one, I've been fortunate enough to be involved in a few very successful 3D modeling software products, and each included many challenging problems. Performance optimization tends to be a very difficult area and it's extremely satisfying to be able to understand algorithmic complexity of a piece of code, then redesign it to lower complexity and observe how the program starts to run a lot faster. And of course it's hard to beat visual aspects of 3D modeling. Writing code that successfully constructs some geometry and displays resulting graphics on screen is also very gratifying. Even more gratifying is observing how others then use this software to design real world things we see and touch everyday, like buildings, automobiles or toothbrushes. Q: Judging by your name, you are likely Russian expatriate like me. Perhaps even a double-agent. This puts you in a great position to compare math education you got and what your kids are getting here. What do you think? I was fortunate to have had great teachers back in Russia. Here, my kids also belong to a good school system, I certainly can't complain :-). It seems to me that the approach here tends to be more exploratory in the elementary school, weaving math into other subjects so it feels more natural. There is also more emphasis on "number sense" as it relates to the connections to the physical world, as opposed to more emphasis on rules and facts in Russia. Q: Do you do any sports, play any instruments (to mislead the neighbors)? I've recently discovered that I love distance running. It's a great sport, which actually has a lot of depth, with many physical and mental benefits. As for music, I know how to play a few chords on a guitar, maybe someday will try to learn more classical techniques when I find the time. Q: Do you think math helped in you in any of your hobbies? I would say math helps with everything, since it's a foundation for logical thinking and common sense. One simple example is that it does help me with my running as I plan different combinations of speed/distance workouts. Q: Did it help you to date your wife? She happens to have a background in applied math and software, so I guess that may have been a topic of some of our conversations when we were getting to know each other. But that was not the prevalent topic :-). Q: It seems that for many of us passion for math came through some early childhood mentor - a teacher, a parent. What about you? My parents were always great about encouraging me, but the really big first push came from my grandfather Aron Faershtein. I was dazzled with how easily he was able to approach a multitude of different math problems, and then to explain his thought process. His lessons gave me a lot of problem solving confidence for the rest of my life. Later, I was really lucky to be a student of Dr. Yuriy Shishamryev who taught me mathematical logic and group theory. He was a wonderfully kind human being, and really a mathematical genius as far I am concerned. Both of these amazing mentors passed away some years ago, but I am sure that thousands of their pupils remember them with fondness. Q: How do you help your kids feel comfortable with math? As with most things in life, the more you do something, the more proficient and comfortable you become. So we try to give our kids opportunities for practicing math and critical thinking in general. Despite our school system being good, sometimes (mostly my wife Alla, and sometimes I) would work with the kids to solve additional math problems at home. 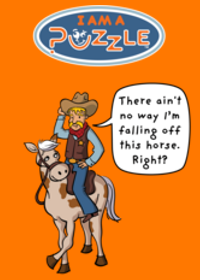 Other than that, Car Talk puzzles are often of the math variety, and there are problems from your blog. As you've been advocating, we also look for to engage their critical thinking when it comes to everyday things and the world around us. For example, I have this funny habit of catching my older son (he is in middle school) when he uses figurative expression "a ton of" in his speech. Last winter, he once mentioned there was "a ton of ice" on the side of a hill. Well, I could not leave that alone, so we ended up estimating how many actual tons of ice there were :-). Interesting. Very interesting. I'll start with the the ice problem. I once tried to estimate the amount of energy needed to produce all the ice cubes used in a year in the US. Have you any idea how to estimate the number of drinks served with ice. I bet that alone could do something to the national debt. I sometimes have used very elementry algorithms to simulate math problems that interest me particularly in combinatorics (which I'm very weak in) so I admire your skills. Nice picture. Do you have trouble finding sun glasses that fit?